As many of you know, Jill Harper was diagnosed with breast cancer in August 2018. 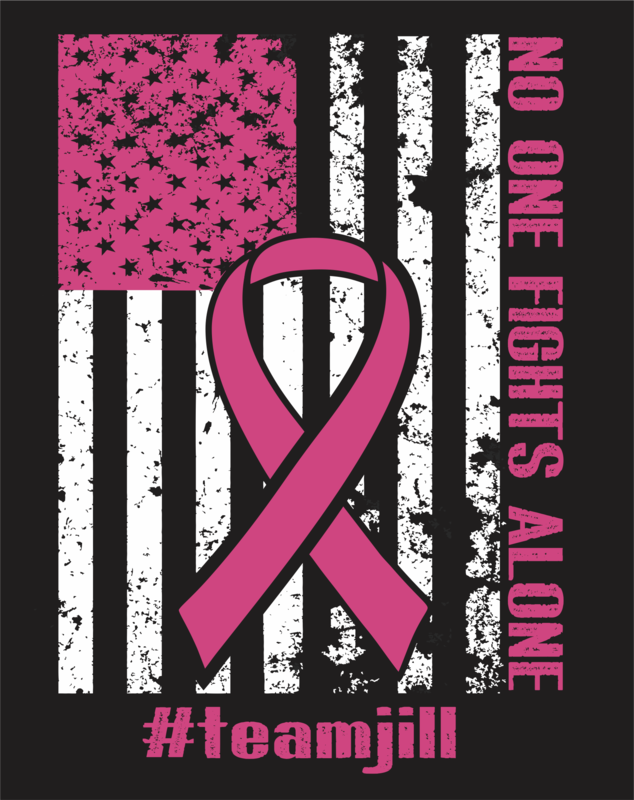 Proceeds from the sale of this shirt will be donated to Jill and her family. Several of her friends are hosting a fundraiser for Jill on February 8. Shirts will be available to pick up that evening, or you may select the shipping option and have yours shipped to you. All orders will be tallied after the January 31 deadline and processed together. Shirts that will be mailed will go to the post office no later than February 7. Additional information on the event is listed below, as well as the facebook link. Please contact us if you have any garment questions. Thank you! Anyone who knows Jill, knows that she is a a selfless woman. She is a loving wife, mother and her family's biggest supporter through everything, including her husband's own battle with cancer. Between driving Emma and Caleb to their sporting events and cheering on Brent while he races, she enjoys spending time with friends, making snacks for all of them to share and has no problem pulling together a last minute Friendsgiving. One thing is for certain, Jill will not rest until she knows everyone is happy. Now it is our turn to show Jill our selfless love and support, so please join us in rallying behind her by attending an event in her honor. We will be hosting a Music Bingo fundraiser at the Smithville American Legion on February 8th. Doors will open at 6pm, with bingo from 7pm to 11pm. Admission to the event is $10 per adult and $5 per child (10 and under). The admission price includes your first bingo card for the first round of bingo. Additional cards per round can be purchased for $1 per card. There will be 4 rounds of bingo featuring a different genre of music per round. There are 3 chances to win per round with a price for each winner. There will also be a 50/50 drawing and raffle items.